REACH BACK – Big Brothers Big Sisters of the Bluegrass recently launched its Brothers Reaching Back initiative in an effort to recruit more men of color to serve as mentors. Pictured are new matches, Big Brother Da’John and Little Brother Tre’Von, and Big Brother Kareem and Little Brother Ty. 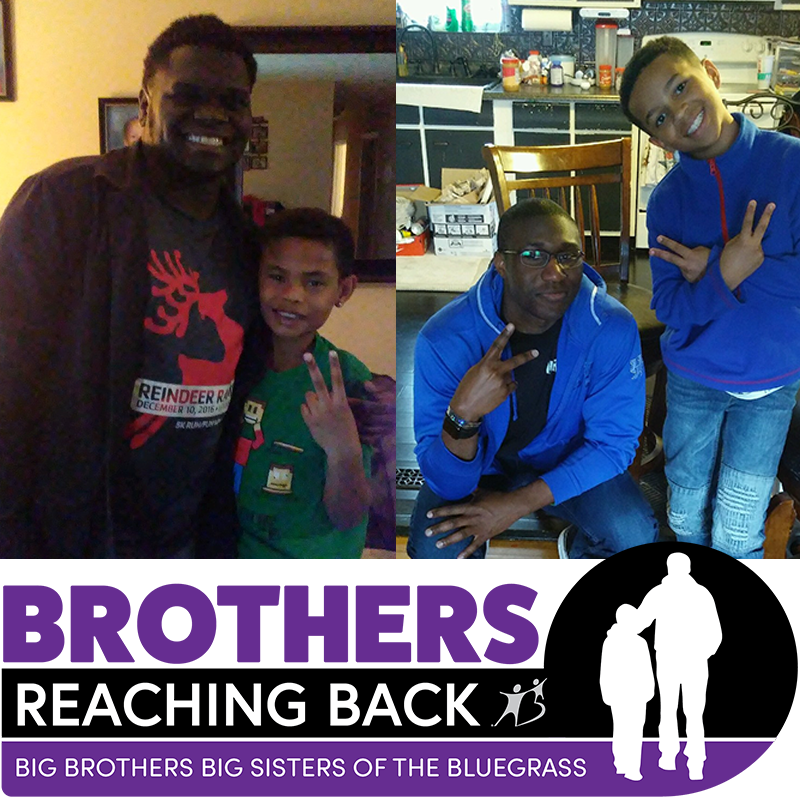 Big Brothers Big Sisters of the Bluegrass (BBBS) recently launched its Brothers Reaching Back campaign in an effort to recruit more men of color as volunteers and to better serve children throughout Central Kentucky. When the campaign launched in early March, only four African-American males served as mentors in Fayette County. So far, two additional African-American men have been matched through BBBS, but their work is far from over. Nearly 120 African-American boys remain on the agency’s waiting list, many of whom have been waiting for more than two years. Longtime BBBS board member and Big Brother Keith Slaughter has mentored his Little, Levi, since he was in elementary school. Levi is now preparing to graduate high school and attend college at the University of Louisville on a full scholarship. While many studies suggest that mentoring is a powerful way to equip, energize, empower, and elevate youth, the effect it can have on the mentor is often just as impactful. There are two ways to mentor with BBBS in Lexington – through the School-Plus program, in which a volunteer meets with a child during the school day for one hour each week at William Wells Brown, Breckinridge, or Booker T. Washington Elementary School; or through the Community-Based program, where matches meet a few times a month to participate in community activities (going to the park, sporting events, etc.). BBBS offers one-to-one mentorships that are flexible and professionally-supported to make the most of your time and impact. Families and volunteers are interviewed thoroughly to ensure that each match made is set up for success. The two newest Brothers Reaching Back matches are Big Brother Da’John and Little Brother Tre’Von, and Big Brother Kareem and Little Brother Ty. Da’John and Tre’Von meet at school and were paired because of their passion and desire to help others. Kareem and Ty meet in the community program and are looking forward to being active together and going to the trampoline park. To learn how you can get involved, visit www.bbbs-bluegrass.org/reachback, call 859-231-8181, or join BBBS and other local mentoring agencies at the Youth Engagement Summit on Wednesday, May 17, at 9 a.m. at the Lyric Theater.